What did you say goodbye to this year? Was it a bad habit? A ’94 hatchback? Or something less tangible? How did you feel the day after? The week after? Or! What did you say hello to this year? Did it enrich your life…or detract? A new favorite possession? A tattoo? Did you decide that your life was missing something, or did you just fall into new-ness? Share your aloha! This year, I took a leap of faith and left my job. It can be scary to quit your job and not really know what’s in store for you in the future, but I knew I had to do it in order to make myself happy again. After two long years of trying to make something work that clearly wasn’t meant to be, I closed the door on that chapter of my life. I decided it was time to be my own boss and see where that would take me. While working for myself has had its ups and downs, but I’m so happy that I finally did it. The previous work situation wasn’t making me happy and that started to show in all aspects of my life. I loved my field of work but needed a change of scenery so off I went. Together with my boyfriend we formed Pulp Functions, a marketing and event services company. 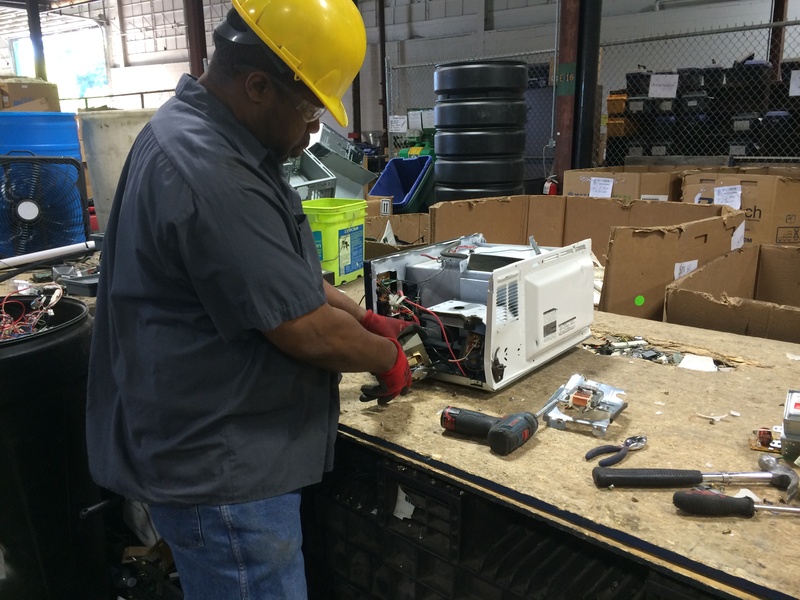 A RecycleForce employee takes apart a television to separate the parts for recycling. I said hello to my first client, an Indianapolis non-profit called RecyleForce. I’ve been so inspired by this organization which has two social missions that work as one. On one hand, RecycleForce recycles electronics to help save the environment. On the other hand, all of the employees of RecycleForce are ex-offenders who are provided with workforce training and other resources to turn their lives around. They are a dream client for me because I’m actually making a difference with the work I do, and I’m also learning so much from these inspiring individuals. One thing this has taught me is that when one door closes, another will open. I have no doubt in my mind that Pulp Functions will be a successful business venture with a lot of hard work and dedication and I can’t wait to see what the future holds for us. Tags: aloha, career, ewaste, marketing, pulp functions, recycling. Bookmark the permalink.